This looks like a great prompt, Tess. I haven't participated in awhile but I will try to do so! this reflects several meanings.. very interesting prompt. Fantastic prompt Tess, can't wait to work on this one! Looks enticing. Typed that one out straight away, must have been waiting for your prompt, Tess. Not based on actual happenings, I am glad to say. Yes this one came on rather fast. I have to say the prompt was sheer perfection for what I am feeling right now and the poem well what can I say? I hope you like it anyway. Apologies, Tess, but mr linky link doesnt like my link, apparently it is not linking to me, I dont want to mess up again, just hope if anyone wants to read mine, the blog homepage message will come up. Tess, you are a genius! Wonderful prompt! Whew! Hard one this time, although my contribution is rather simple. 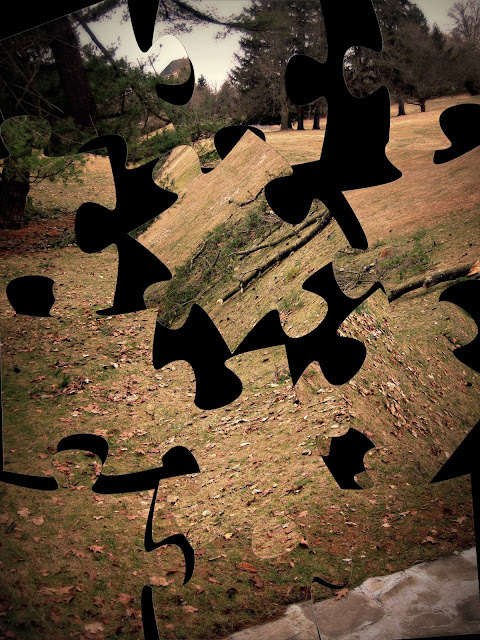 Life's a daily jigsaw with ethereal possibilities. Life's a jigsaw with Etheree possibilities, with apologies to Paul up there! a lovely prompt, thank you, Tess. I think I have worked this puzzle at an on line puzzle site. Great prompt. Didn't know what it would bring until I committed to write. I love following that process. Thanks Willow. That reminds me of the present earthquake in NZ. hummmm - wrote it but false alarm. I'm going with the tree theme, but not the puzzle theme. Great prompt! This isn't a new poem, but it is one that has found a missing piece, in the prompt. Everything puzzles me these days..so thanks! This image was embedded with the muse! Quick, easy, rewarding write. Thanks again! A very interesting prompt. Thank you. My mind went crazy on this prompt-too many ideas! Finally narrowed it down and produced this. Hope you like. Usually my mind can just run, but with this picture it felt caught in the wind. I'm posted, and at #54, too, which is also my age! A lovely little bit of serendipity. I'm posted too. Good prompt - so good meant too many flashing thoughts so had to narrow it down to something simple. I added my 2 cents worth. Thank you! Sorry for the multiple posts earlier, but I got screwed up on the previous links. Hopefully I got it right finally. Great prompt as always. Sorry Tess, I did the link yesterday but forgot to leave a comment. exemplifies my feeling on the jigsaw currently laid out on my table. Desert-, sawdust- I run screaming for the fridge- hopefully I can make it in time for next week! Thanks. I wrote this one for another earthquake. It seems to fit the photo in both the shattered landscape, and the interconnectedness of our existence on this planet. A mistake in the URL I entered, WIllow, but the link takes readers to the intended post! Same theme as ~T~ above, and maybe one or two others. Mine has no basis in reality! Oh I am in a rowdy mood tonight! This prompt is a CERTAIN food for thought (and poetry), Tess.. looking forward to reading as many magpies as possible!!! Some prompts I look at and it takes ages to decide what to write about but given the events of the last few months... floods, cyclones & earthquakes... I knew straight away what to write. My blog, Writerquake, is three years old today -- and your earthquakey-looking image tops my blogoversary post. Please come by for a piece of birthday quake (sorry, I just couldn't resist the pun!). Great pic prompt, thanks. I think my poem still needs some work, but I'm posting it anyway, before the link closes. Hi! I tracked you down from Writerquake's site. I will try to join in, but for the meantime, here's my reaction to the image you've posted. And another in my door. And a black hole in the floor. The one's who went away. They are ghosts, I guess. This prompt will bring out a cracking variety...! Things combined, but took a while to find the right words. Great prompt! My first participation here! Loved this prompt!!! I think I created a story I will be going back to for some time. I'm loving the characters and the possibilities. Thank you!!! After finishing a poetry challenge yesterday, I was in dire need of new prompt. I have been here before, but managed to misplace the site address. This should be fun.